Corn Capital Innovations > Innovation Blog > Farm Profitability > How Does a Cold Winter Affect a Growing Crop? How Does a Cold Winter Affect a Growing Crop? When you were riding in your tractor this fall tilling your fields, did you consider how your tilling method could influence the conservation of your soils during the long, cold winter? If you tilled deep with a plow, you exposed a lot of black dirt making the ground prone to erosion from the freeze and thaw cycle, which leaves no residue to hold the soil in place. Your soil will move significantly less if you tilled your ground and left surface cover. This winter has been brutal! We’ve had very high winds and limited snow coverage. Has this caused soil erosion issues? Of course it will vary from field to field, but you will see the common thread is tied directly to agronomic practices! 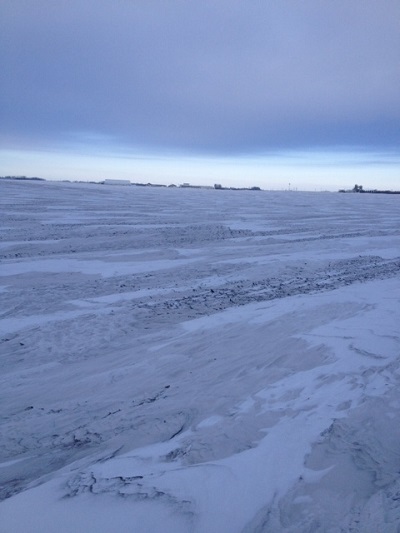 Above is a photo of a field that was vertical tilled in the fall, note the fact that snow distribution is even throughout the field and there has been a minimal amount of soil movement. This is what we want, an even playing field for snow distribution, limited soil erosion, and the right amount of surface residue! How does this deep freeze affect frost and your soil? Warmth penetrating the surface working downward into the soil. Inherit warmth from the subsoil working the frost out from below the frost line upwards and eventually meeting up with the surface penetration, thus eliminating all of the frost. The key here is to see how deep the frost is on bare ground vs. the frost depth under sod. The Southwest Research & Outreach Center; located just outside of Lamberton, Minnesota has two frost tubes which are read weekly throughout the winter season. They place one tube under bare ground and the other under sod. Click here to find out what the frost depths levels are! This is a good time of the year to drive by your fields and identify how your fall tillage practices are influencing the conservation practices of your soils. If a lot of black dirt has been exposed, with little surface residue, there will be a significant amount of top soil lost from the winter. This has a lot to do with limited snow cover and high winds. Surface residue will also play a role in ‘stand establishment’ early in the growing season in lieu of high winds and erodible soils. What are you finding in the fields in your location? Share with us below!